Our Metal Memorial Plaques can be manufactured from either Black Anodised Aluminium, Silver Anodised Aluminium or Stainless Steel and are Rectangular shape. 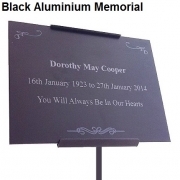 This product is supplied with a Black Metal Label Holder, measuring at 54cm long, which allows the plaque to be displayed in the ground. It will last for years outdoors and will require little maintenance. We estimate that delivery will be made in around 3-5 working days from the receipt of your order and payment. Please state the font style you wish for the engraved text in the order notes section on the checkout page. If no font is specified, then the font that will be used is Times New Roman. 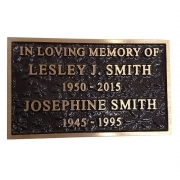 When adding your text instructions to your order please use CAPITALS and Lower Case lettering as you would like it on the plaque. We arrange for all text to be centered on labels. If you would like your text to be aligned differently, please specify in the order notes section during checkout. *If you require more than 4 lines of text OR if you want to add a different graphic, please call us to place the order on 0845 9008 908. Please note that these changes may incur an additional charge. 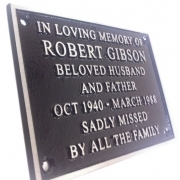 Engraved Plastic Memorial Plaque. Supplied with Metal Label Holder. 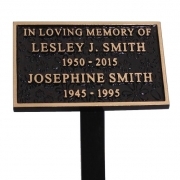 Engraved Wooden Memorial Plaque. Supplied with Metal Label Holder. 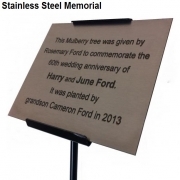 Cast Aluminium Memorial Plaque supplied with stake attached. 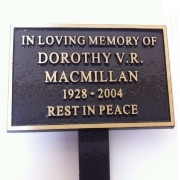 Cast Bronze Nameplate including 4 fixing holes. Cast Aluminium Nameplate including 4 fixing holes. 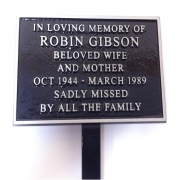 Cast Bronze Memorial Plaque supplied with stake attached. 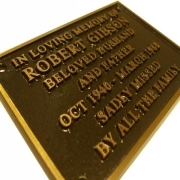 Cast Bronze Textured Memorial Plaque supplied with stake attached. Cast Bronze TexturedNameplate including 4 fixing holes. 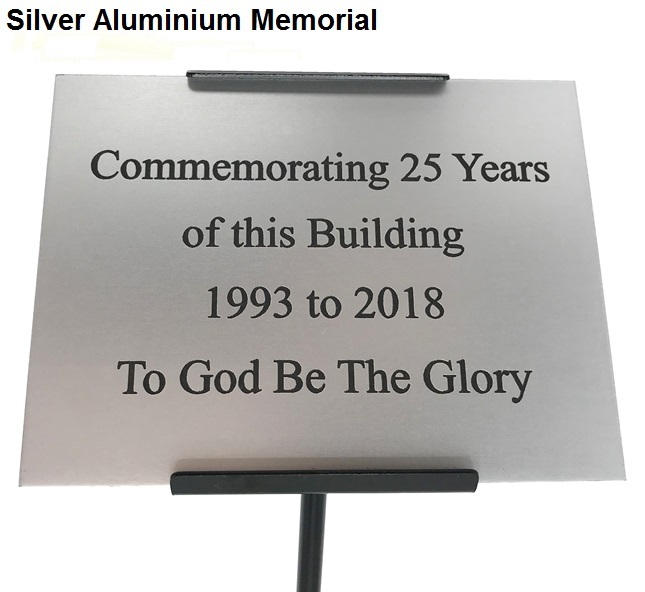 The Plaque was just what we needed and the right size. 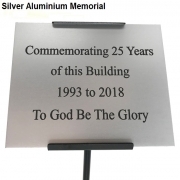 Thank you for being helpful as i said to you i have been looking for a metal plaque for a while and yours was the only one with what we wanted. Now sitting proudly on my Dads grave. The plaque has arrived safely on Friday, many thanks we are all absolutely delighted with it!! Many thanks for all your help and service. Thrilled with the label, absolutely lovely. As more grandchildren appear under the gooseberry bushes I shall be back for further signs to mark the event!! Thank you so very much for all your time and patience with me over the ordering of the plaque for the planting of the Maltese national plant. The plaque arrived yesterday afternoon and looks great- our Vice chair ( who is Maltese ) was pleased with the result !